Sharjah, UAE, 4 April 2018: Over 30 world-renowned Italian Jewellery companies will be exhibiting handmade, contemporary and tradition pieces at ‘The Italian Luxury Jewellery' pavilion during the MidEast Watch and Jewellery Show opening tomorrow and running until 7 April at the Expo Centre Sharjah. According to the Italian Trade Agency (ITA), the UAE is a key growth market for the Italian jewellery industry with nearly USD 1 billion (EURO 873 million) worth of Italian jewellery exported to the country last year. The UAE is the second most important world export market for the Italian jewellery industry. With over 90 per cent of jewellery being imported to the UAE, Italy enjoys prominent market shares and leadership ranking in the segment of fine jewelry. As one of the top exhibitors at the show, this will be the 26th year that luxury Italian jewelers participate in the regional trade show that has become one of the top international shows of the jewellery industry. Housed amongst the pavilion will be the exclusive ‘Italian Lounge', which will offer a discreet and comfortable setting for guests to enjoy the most special collections that Italian designers have to offer during the five-day event. 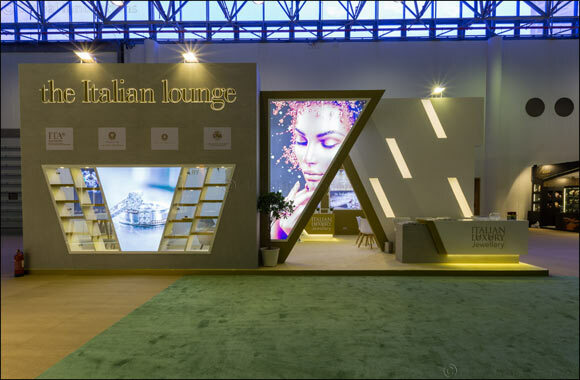 The ‘Italian Lounge' is a dedicated area organized by the Italian Trade Agency (ITA), Trade Promotion Office of the Italian Embassy, in cooperation with the CNA (Italian Association of Artisans and Small-Medium Enterprises). The MidEast Watch & Jewellery Show is held under the patronage of His Highness Dr. Sheikh Sultan Bin Mohammed Al Qassimi, Supreme Council Member and Ruler of Sharjah, and will be celebrating its 44th show in April 2018. Heralded as a vast regional success, the show attracts over 500 exhibitors and 60,000 visitors during its past editions. Please visit The Italian Luxury Jewellers and the Italian Lounge at Hall 4.